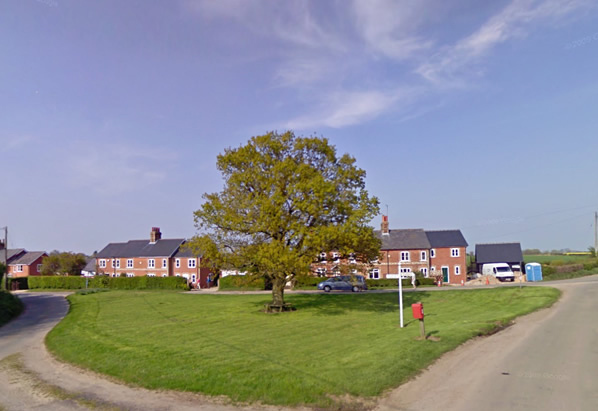 Abbotshill doesn’t really exist, nor is it based on any particular village between Ipswich and Colchester. I scouted the general vicinity via Googlemaps before I wrote The Abrupt Disappearance of Cousin Wilfrid, but this was a part of England I’d never actually visited–until a few weeks ago. On May 25, I rented a car in Colchester and drove east on the A12 out into the Suffolk countryside. I knew I wouldn’t find any place that exactly corresponded to my idea of the village where Freddie visits his aunt, but I thought I’d see what was really there. Once I turned north off the A12, the countryside I drove through was a tangle of lanes between scattered farms and villages. A few recently built housing developments and modern industrial parks have encroached on the area, but for the most part it remains just as it must have been 90 years ago. 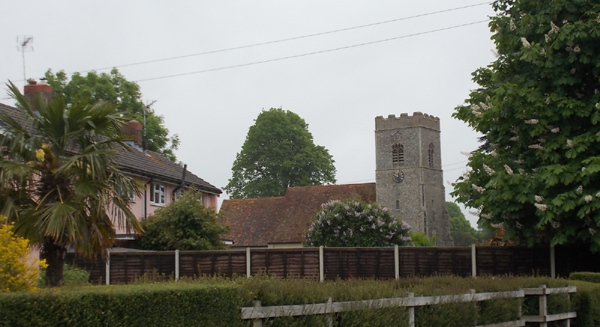 Besides Capel St. Mary, there was nothing as large as my imagined Abbotshill, nor any old villages formalized around a pond or green; these were mostly collections of a dozen or so houses, perhaps near a church. I did spot one promising, empty site on which I might place Abbotshill–a pond of the appropriate size with ground slightly rising behind it. This could easily be the Abbey Field, if only there were a ruined abbey in it. While not as impressive as Whitby or Glastonbury, the ruined tower and fragments of walls retaining gothic tracery rose picturesquely from the tall grass and drew their share of sightseers during the summer months. There is a priory ruin in Colchester itself, next to the Town train station and visible from the platform, but none in this countryside. The house belonging to Freddie’s Aunt Dorothea–a desirable property that caused a great deal of envious quarreling among the Babington family for generations–would be in a lane on one side of the Abbey Field. I looked for buildings that resembled Dorothea’s home, but Georgian brick houses are rare here. 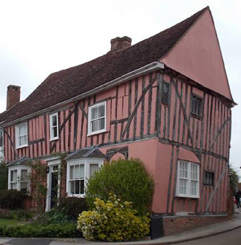 The oldest houses I saw on my drive were either timbered black-and-whites (sometimes painted grey), or else lone samples of that remarkable higgildy-piggildy style of building you’ll see around Suffolk, most prominently featured in Lavenham, just to the north, where no two walls meet at the same angle (and are frequently painted pink). I did, however, pass by an inn very like the one where Wilfrid Babington-Loewes was last seen before his abrupt disappearance, although it’s farther south than Hadleigh. Approaching Hadleigh from the south, I kept an eye out for something similar on the outskirts of the town but saw no other old-fashioned pubs or inns. The Queen’s Head will do very nicely for Wilfrid’s final appearance. Set at the fork of two roads, it would be the perfect spot for a mysterious black car to pick up a passenger late at night and drive off in the direction of Lavenham–which is what I eventually did after I’d had my fill of wandering and getting lost in the lanes. So, my morning’s drive through a place I’d never been before was instructive. Even though there was really very little that corresponded to my imagination, I did gain some fresh impressions about the local, historical architectural styles of the area. I also have a better sense of the landscape of the place and the small villages within it. Also, at the end of that same day, I visited a Tudor-era tower that will figure in my next Freddie Babington mystery. Next Next post: Dark Shadows… In the Future!